Skull 5 (D4500 cranium & D2600 mandible) is one of the most complete skulls of a Pleistocene Homo specimens. 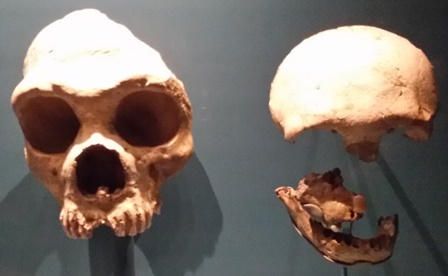 Its small brain volume (550 cc) is tiny in comparison to the other Homo erectus skulls from Dmanisi, which is another feature of the high variation in morphology of all the specimens in that site. Dated to c. 1.77 Ma. This fossil was dated to c. 600 Ka and the original is lost. Thought to be a female. 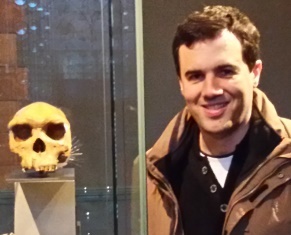 The hominin fossils and stone artefacts from this site suggest that Homo erectus lived as hunter-gatherers and that meat formed a key part of their diet. 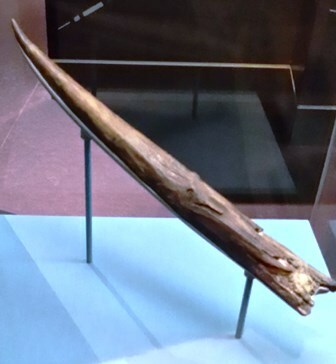 Made of yew, this spear point is the oldest preserved wooden spear in the world (c. 420 Ka). Its owner probably have used this as a lethal weapon, stabbing prey at close range to generate enough force to pierce the animal’s skin. 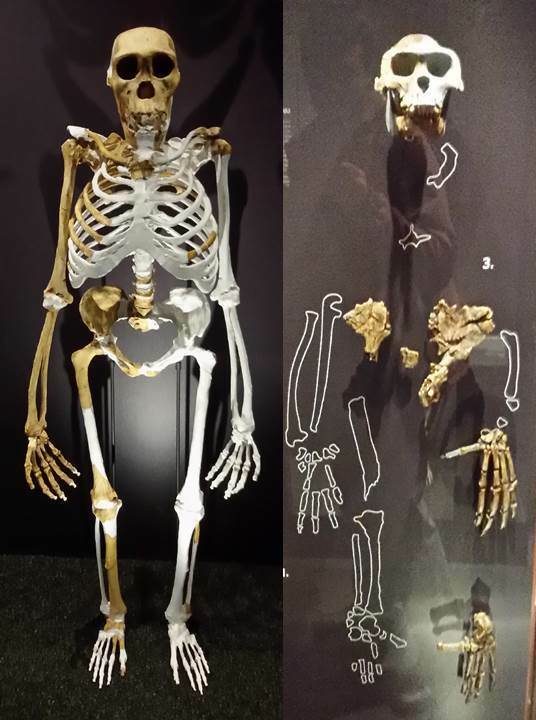 4) The most easterly example of Homo heidelbergensis? 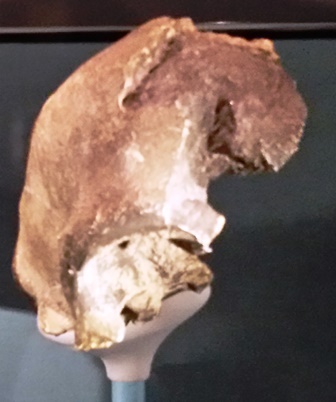 This partial skullcap is one of the only early human fossils found on the Indian sub-continent. It has c. 300 Ka. and was found by the Narmada River. Tibia from Kabwe, Zambia (left). Its length indicates an adaptation to the subtropical environment of Zambia 300 KYA, as it provides a larger skin surface though which to help cool the body. 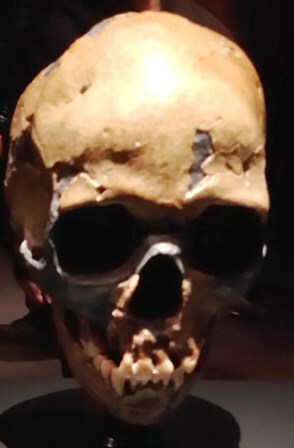 Assigned to Homo heidelbergensis. 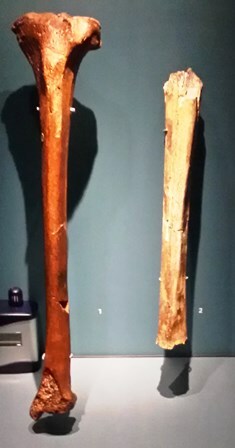 Tibia from Boxgrove, England (right). This shinbone has been chewed at each end by an ancient carnivore, but scientists can still decipher it belonged to someone large and robust, about 1.8 m tall and probably male. Intense physical activities such as hunting large animals would have encouraged the growth of a stronger, tougher build in Homo heidelbergensis, in response to the stress placed on bones. 6) Qafzeh 11: a teenager modern human from 90-120 Ka. 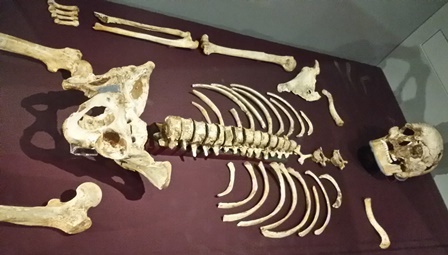 This specimen was 13 years old and was placed in a burial site with red deer antlers placed on the body. Dated to 90-120 Ka. This skull was found inside Grotta Guattari, in the same layer of sediment as many hyena coprolites. Signs of fracture around its right eyebrow and cheekbone and other tooth marks suggest hyenas scavenged this individual soon after death. Dated to c. 50 Ka. 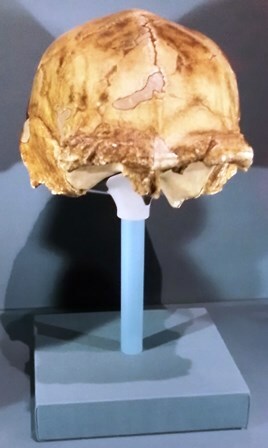 Forbes’ Quarry skull is a female discovered in 1848. It is dated to c. 50 Ka and museum scientists are working with dating labs to accurately calculate its age. Devil’s Tower was a 4-year old child according to the growth lines on the teeth. The front incisor is erupting. Dated to c. 50 Ka. 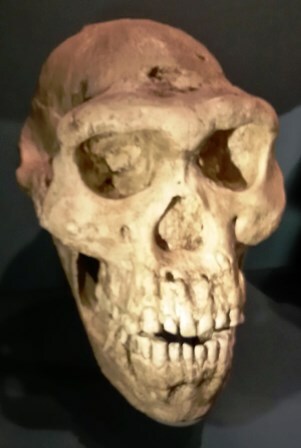 Homo sapiens, Gough’s Cave, Somerset, England. 14,7 Ka (left). 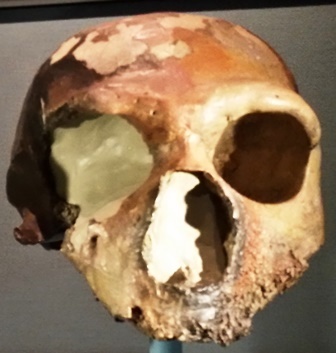 Cut marks and dents reveal that this skull was thoroughly cleaned of any soft tissues shortly after death. After removing the bones of the face and the base of the skull, it was painstakingly shaped into a cup. Homo sapiens, Gough’s Cave, Somerset, England. 14,7 Ka (right). There are cut marks on the upper jaw, where flesh was removed. It belonged to a teenager. The ‘Cheddar Man’ is dated to c. 10 Ka. He was 1,66 m tall. The hole in his forehead was the site of an infection, which may have killed him. The DH1 skull of Homo naledi! Esta entrada fue publicada en Exposiciones y museos y etiquetada Fósiles. Guarda el enlace permanente. FINALLY SOLVED : The human evolution (30 hominins / 7 million years ago ) must consider the evolution of intelligence, but I have found only “the evolution of emotions”. These three processes intersect at one point – baby / human infant that is incapable for independent survival for many years. That is not an evolutionary mistake, on the contrary, that is the key element. By observing his mother’s behavior, a process called MSP/multi self-projection passively occurs in baby’s brain when child perceives guardians body as his own. That way infant’s CNS immediately learns the shortest way to get something done which enables the creation of many more similar thinking processes till the moment when a minimal number of thinking processes ( Adam’s number ) are required in order to effect of self-consciousness arise.